How do these different approaches to physical care help to resolve your health concerns? If the foundation of a house shifts from its normal structural alignment, the resulting damage can be devastating. 1) Cracks in the walls, 2) creaky floorboards, and 3) windows that don’t open properly are just a few of the symptoms of the underlying cause, a structural shift of the foundation. Each of these approaches have their place in your care, but each work in different ways. Let’s use a house as an analogy. Imagine you start noticing difficulty in sliding the house windows up and down, or the doors not shutting correctly, or even noticing a fissure in the wall. Now, you could treat these problems one by one. First, you could start by putting some WD-40 on the window tracks to help them go up and down more smoothly. Then you could shave the door down so that it will shut into the frame better. You can even put paint on the fissure to cover it up. But how long will these patches last for? Usually they come back, over and over again or lead to larger more costly repairs in the future. Until one day you get a builder out to check the foundation of the house. The builder notices that your home’s foundation has shifted and is causing many of these secondary problems you are experiencing with the house. By fixing the houses’ underlying structure and doing a little bit of work on the secondary repairs, you find things to be right again, and future expenses are avoided. No more need to keep shaving down your doors over and over again or re-patching and painting the walls! Similar to the house, the foundation of your body is your spine. Structural damage to the spine may be the underlying cause of a myriad of symptoms you are experiencing. When your spine shifts from its normal position, the shifts may impede your body and nerve signals from functioning correctly. 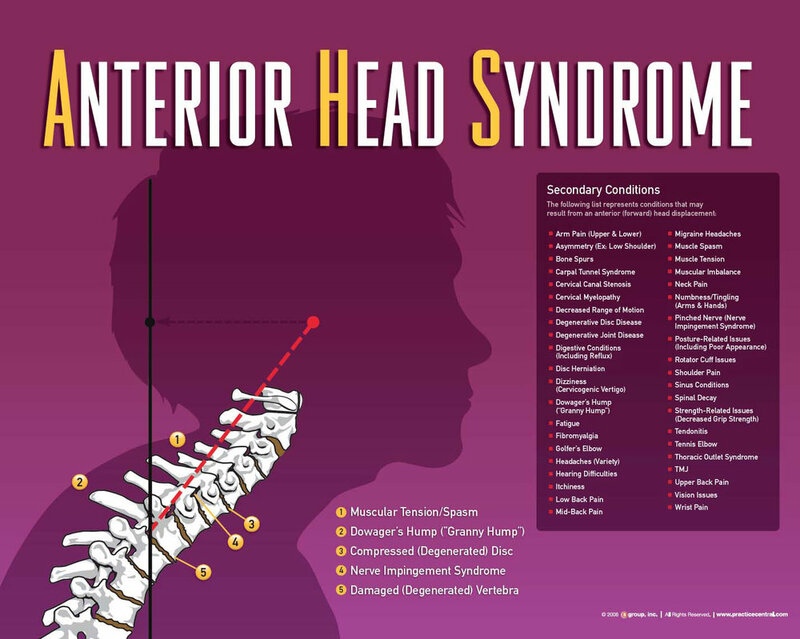 Some of the secondary conditions you might experience are tightness in your neck and shoulders, pain in your hips and/or legs, headaches and migraines, and digestive issues just to name a few. Now just as before, you can treat these problems one by one. You can go to a massage therapist who will look at the soft tissues that hang on the frame of your body. They will find tight spots and loosen them up giving you temporary relief. Massages, however, don’t work on your foundation as much as they work on the outer muscles of your body. This is similar to putting WD-40 on a squeaky window that doesn’t go up and down correctly. When it comes to your health, there’s no silver bullet. 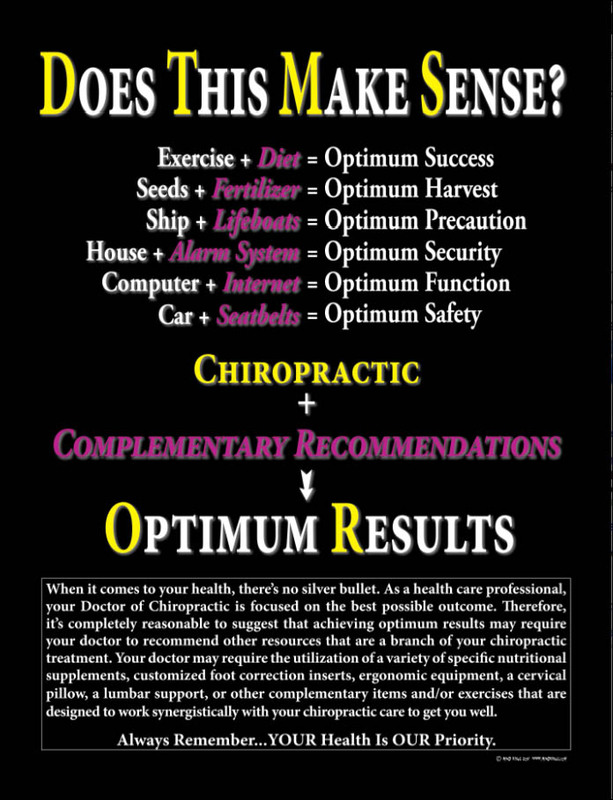 As a healthcare professional, our Doctors of Chiropractic are focused on the best possible outcome. Once your structure is being addressed, the massage and physical therapy may work synergistically with your chiropractic care to achieve optimum results. Then, let’s say your massage visits don’t quite do the job and your problems keep coming back until someone recommends you visit a physical therapist. The PT will check your areas of complaint and find areas that need to be stretched and/ or strengthened. They might say your muscles aren’t “firing” in certain places which is why you can have dysfunction in your back or leg. They will try to stretch and strengthen certain body parts to improve their function. 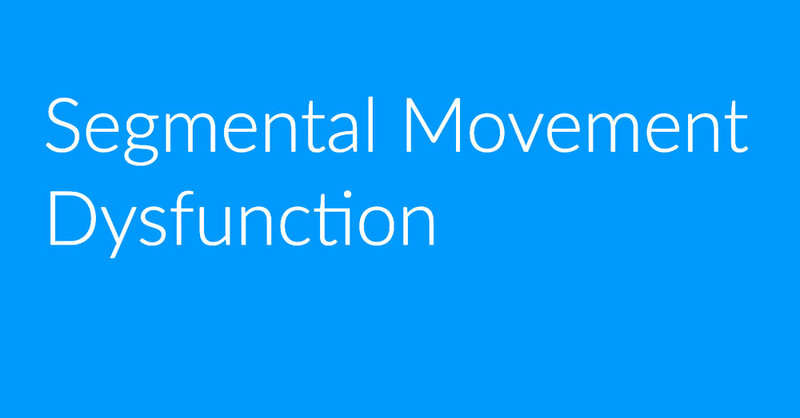 Often times this will begin to help, but might lose momentum as the stretches and exercises are not addressing the true root cause of your conditions. You see, neither the massage therapist or the physical therapist is taking a look at correcting your foundation, nor do they have the tools. Instead they are working on the surface areas and secondary conditions. 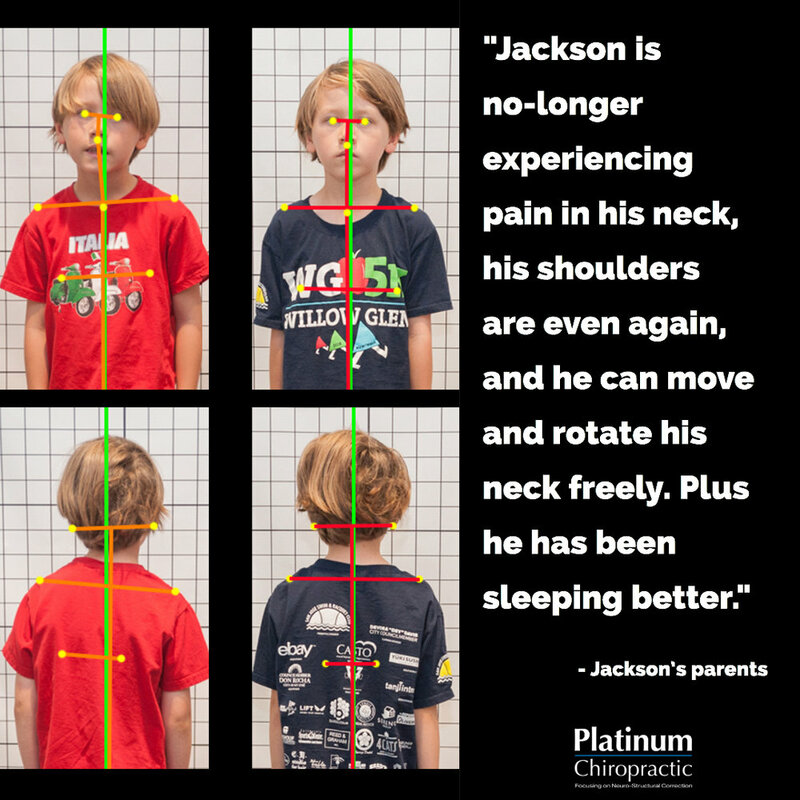 Doctors of Chiropractic who focus on Neuro Structural Correction examine your foundation with many objective measures to see if your structure is shifted from a normal position. These shifts cause pressure on your nerves and can be causing symptoms or dysfunctions down stream, leading to pain and dysfunction. Only when theses spinal shifts are corrected, are your secondary symptoms able to resolve naturally. Once your structure is being addressed, the massage and physical therapy may work synergistically with your chiropractic care to achieve optimum results. SMD takes the same principals as MDS and relates them to the joints or segments of the body. Each and every one of your segments are designed to move throughout their full range of motion everyday in order to stay healthy. When these segments don’t move, become fixated, or distort the proper alignment, a toxic or negative sensation is sent to the brain beginning a decrease in the normal functions of your body, increasing your body’s stress response, increasing muscular tension, and leading to degeneration and disease. Why Cut What Can Be Untied? The Rubber Band Game... Ever played? When the physical obstruction leading to secondary issues (loss of circulation, finger ache, skin color changes) is removed, the finger can eventually return to more normal feeling AND function (assuming the damage isn't irreparable). Here's how the 'game' works: Wrap a rubber band around one of your fingers. Within a period of time you'll observe how the skin begins to change color and the finger aches as the the blood and nerves are being obstructed. Now, imagine what would happen if you left the rubber band on your finger for the next hour, day, week, or even longer? The symptoms your finger is experiencing will keep getting worse and eventually will suffer irreparable damage! So, let's think about the options to address this issue. Which would you choose? Exercise the finger. This might make your finger feel better; but it doesn't correct the cause of this particular problem. Massage the finger. This can offer temporary relief; however, the rubber band is still there causing the obstruction. Apply some pain relieving cream or medicine on the finger. This can also offer temporary relief, but does not remove the actual cause. Cut the finger off. This can certainly remove the obstruction (and more). Now there's also permanent damage in the body. Remove the rubber band. When the physical obstruction leading to secondary issues (loss of circulation, finger ache, skin color changes) is removed, the finger can eventually return to more normal feeling AND function (assuming the damage isn't irreparable). Why are we talking about fingers & rubber bands? 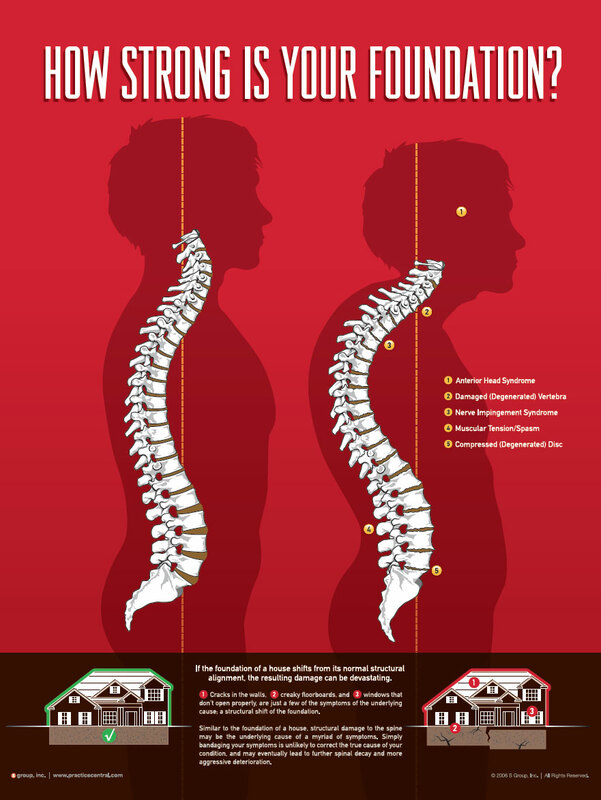 You see, a Neuro-Structural shift in the spine is very similar. It places an obstruction on the nervous system, blood vessels, and other connective tissues just like the rubber band on your finger. This obstruction can lead to secondary issues like back and neck pain, migraines, numbness & tingling, muscle tension, and even lowered immunity. 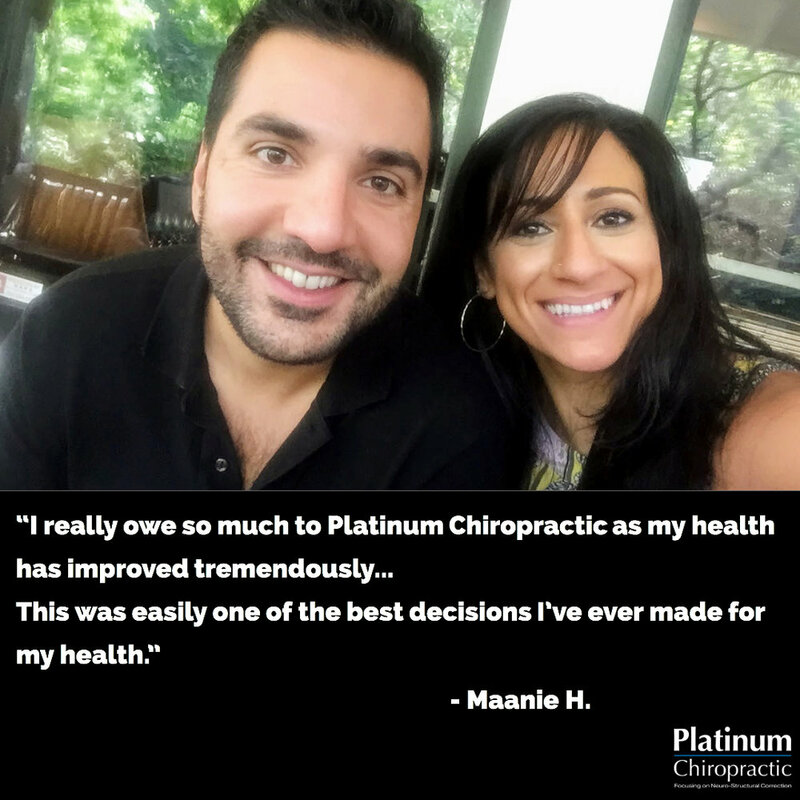 When people first visit us at Platinum Chiropractic, many people have previously tried the other common solutions to their problems such as taking medicine, going to physical therapy, or having a massage in order to resolve the secondary issue(s) or symptoms they're dealing with. 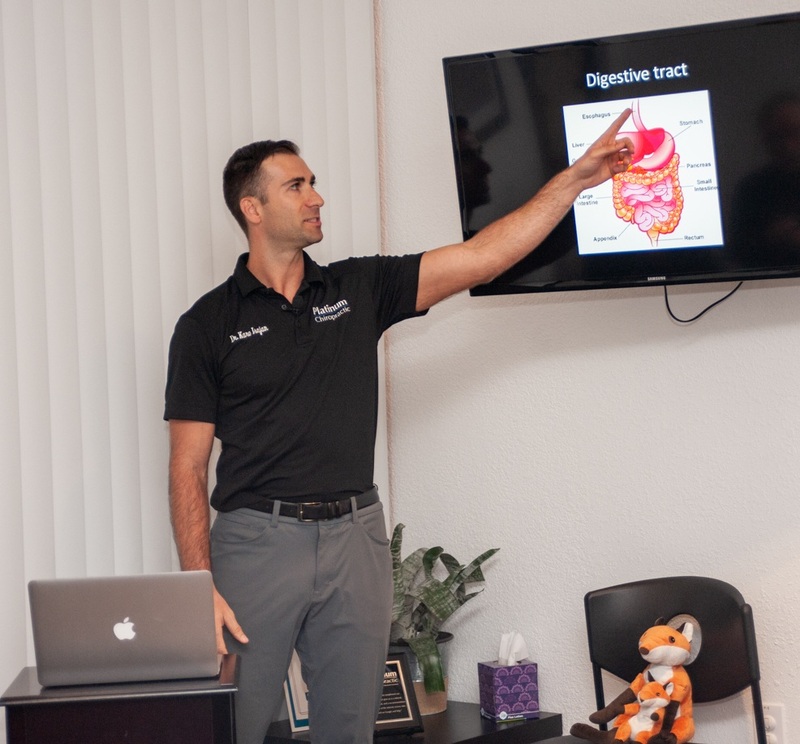 Our unique focus as an office is that we look for the underlying structural cause of the problem and apply a results-driven plan of Neuro-Structural Correction to FIX it. The adjusting of the Neuro-Structural shift is how we can remove the obstruction to the nervous system and reduce the frequency of it coming back. Since January is Thyroid Awareness Month we thought we would talk about your thyroid’s roll in your body, what happens when it isn’t working correctly, and what you can do to support your thyroid’s function, including Neuro-Structural chiropractic care. Still have questions? Contact our practice in Santa Clara, CA to schedule a Complimentary Consultation. Patients often ask us about thyroid problems and if chiropractic can help. Since January is Thyroid Awareness Month we thought we would talk about your thyroid’s roll in your body, what happens when it isn’t working correctly, and what you can do to support your thyroid’s function. As you may already know, your thyroid is an endocrine (hormone) gland located in your neck right under your voice box. This gland influences every cell in your body. It regulates your metabolism, controls fat burning, and influences the growth and development of nearly every process in your body. Pretty important right? Additionally, its nerve supply and connection to your brain comes from the Recurrent Laryngeal Nerve, which is a branch of the Vagus nerve, located at the C4-T1 levels of the cervical (neck) spine. So, now that we know what our thyroid glands are and what they do, we can talk about what happens whey they are not functioning correctly. An unhealthy thyroid can lead to many health issues such as fibromyalgia, irritable bowel syndrome, acne, eczema, gum disease, infertility, cancer, and autoimmune diseases. The best way to diagnose a thyroid issue is through blood tests and a full thyroid panel. A lot of times a standard blood test isn’t complete enough to get a full picture and will often times under diagnose a thyroid problem. Treatments for thyroid related problems vary from standard medical hormone replacement to more natural ways with nutrition and lifestyle changes. Regardless of which course of treatment is chosen, changes to your lifestyle are imperative because a thyroid issue is typically a symptom of a larger problem. If you are only treating the symptoms, the underlying root cause will not be addresses and will manifest differently later in life. 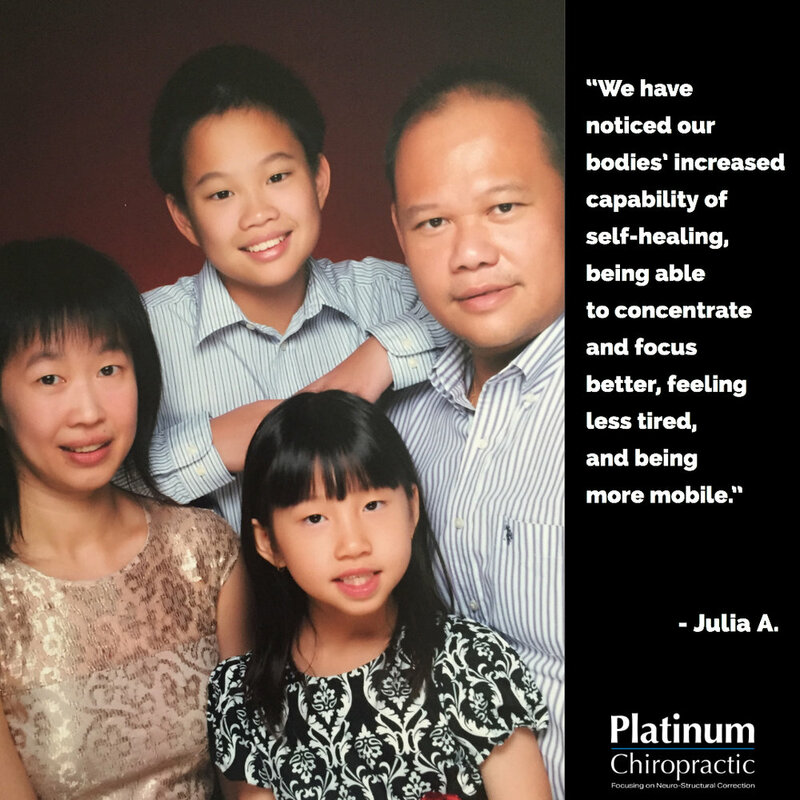 At Platinum Chiropractic our goal is Neuro-Structural Correction of the spine and nervous system. In this way we improve and normalize the function and connection of the nerve supply from the brain to the body, allowing glands such as your thyroid and other bodily systems to work properly. We have many patients who have seen incredible improvements in their thyroid function as a result of specific chiropractic adjustments. Have more questions? Schedule a Complimentary Consultation to speak with a doctor. Anti aging, your health, and what you can do. As times goes by, we all notice the effects of aging. What if we could slow down this decline? Science is starting to really look at how we can control or help our genetics to perform better. One of the ways that DNA is measured is through the telomere length on the end of a DNA strand. Telomeres are the strand of DNA that is attributed to aging and healthy cell function. Throughout your life, they are essentially "used up" to create the cells in your body. Once your telomeres are used up, you no longer produce healthy normal cells, and you begin to decline. Fortunately there is some good news. One of the features of consistent chiropractic care is its positive affect on DNA. Consistent chiropractic care lengthens these telomere strands, which result in normal production of healthy cell tissue, wow! Check out this pdf article for more information. Inflammation: What You Need To Know! Top 7 Facts on Inflammation: Tuesday Nov 13 at 6:30 pm. For November we have an Inflammation workshop planned for you. Dr. Karo will be presenting the top things you need to know about inflammation and how it can help you live a healthier life. Friends and family are welcome, space is limited. The opioid epidemic is a serious problem and we are proud to be a part of the solution. Before you turn to pain medication, find out if Neuro-Structural chiropractic can help you. I am sure you have all heard about the opioid epidemic that the US is facing, but did you know that chiropractic care can be a part of the solution? In fact, "adults receiving treatment for low back pain are 55% less likely to fill a prescription for an opioid if they are receiving chiropractic care." That is a big number! Check out this article in Boss Magazine by Dr. Sherry McAllister of which talks more about how chiropractic care offers drug-free solutions. And when you have a friend or family member looking to pain prescriptions for relief, have them give us a call, we would love to help. In your body, inside your spinal cord there exists a flow of cerebral spinal fluid (CSF) that circulates into your brain and flows back down your spinal cord. This fluid carries nutrients throughout and removes waste from your central nervous system. It even has its own immune system and cells that are different from the rest of your body. 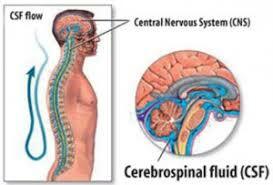 It is vital for the function of your brain tissues that the flow of your CSF is maintained and unimpeded. So the question is, how do you make sure the proper flow of your CSF is maintained? Well you are in luck because, that is one of the benefits of being under chiropractic care with specific adjustments. What you may not know is that Neuro-Structural correction affects, and helps to normalize the flow of your CSF by reducing Neuro-Structural shifts that cause blockages in your spinal cord (Think of how blockages in your arteries, can cause problems to your blood-circulatory system). Other ways that you can naturally affect the movement of your CSF is via exercise and breath work, like in yoga and meditation. Schedule a consultation to find out more. Year One in the Books! 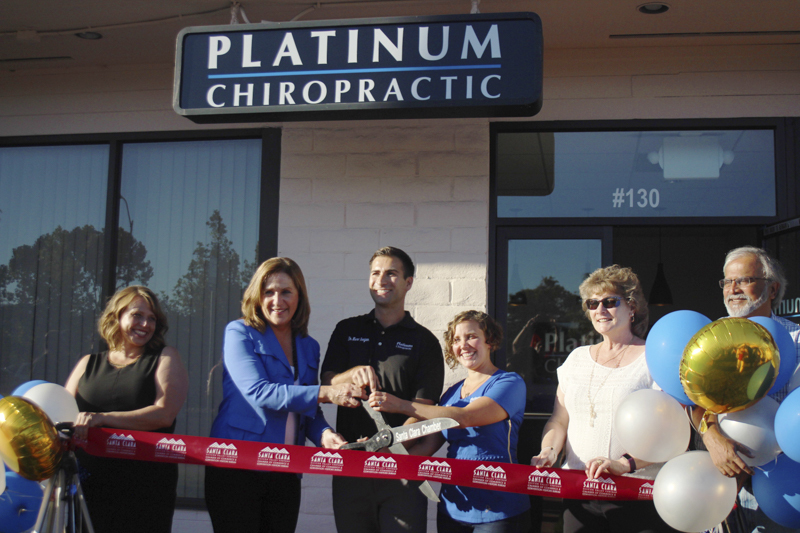 Platinum Chiropractic’s grand opening at their new location in Santa Clara with Mayor Lisa Gillmor. Can you believe this Friday marks 1 year since our Grand Opening/Ribbon cutting ceremony for the new location? Neither can we. 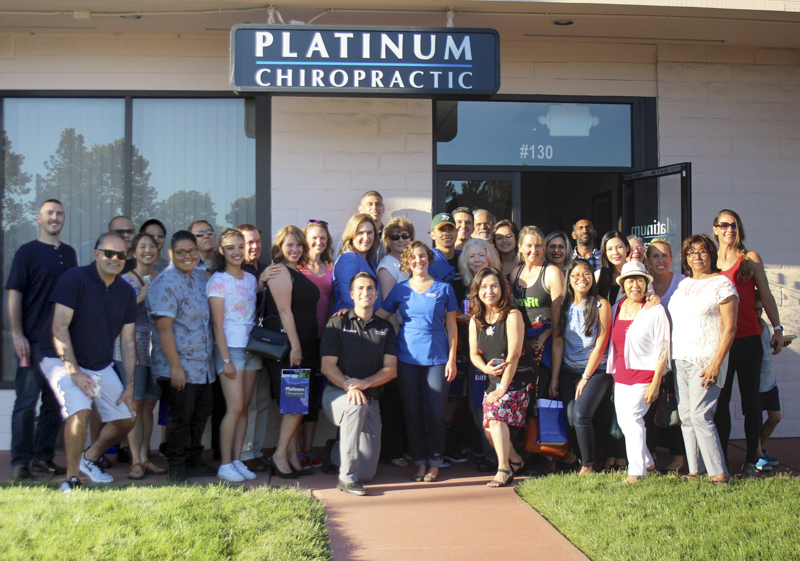 Stop in Sept 24 through Oct 5 for your very own Platinum Chiropractic T-shirt, as well as other cool gifts we have for you. Follow along on our social media channels for photographs recapping the last year…. you might find yourself in one! 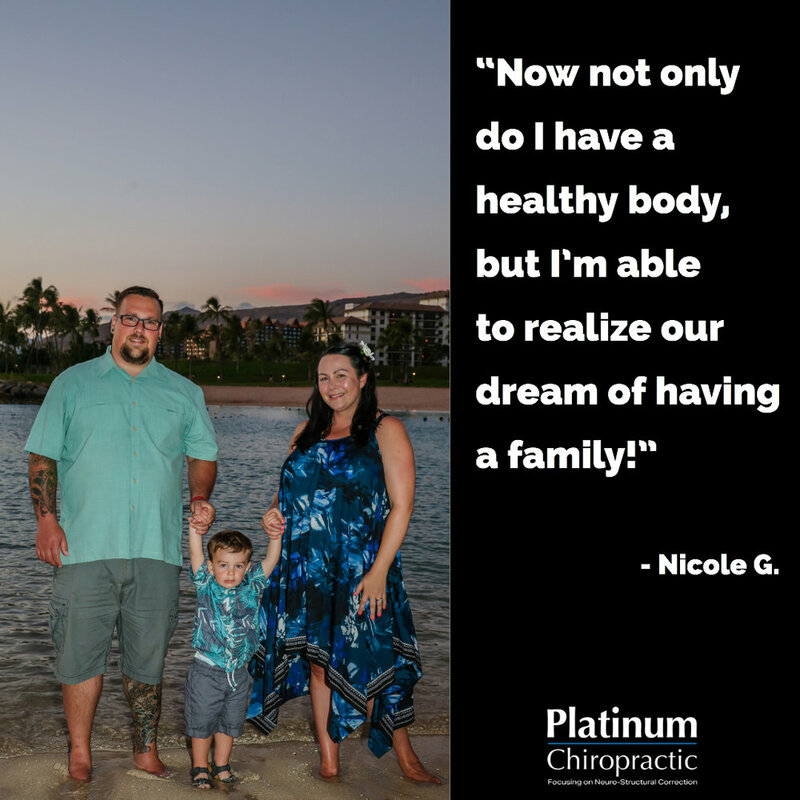 Thank you to our Platinum Chiropractic Family making this an unforgettable year!